Harrowfield Hens have a ‘chook palace’ that we were told is overkill. Our chooks are very loved though, so we don’t agree. It is constructed from recycled hardwood along with historic corrugated iron – the old roofing off Burrundulla House. It is elevated to allow good air circulation plus also a weatherproof area underneath for them to take their dust bath. They have a constant supply of fresh food and water and they also get to enjoy food scraps from the house. Each afternoon they explore the paddock for a scratch about searching for worms, bugs, seeds and other interesting food. They then head back to their ‘palace’ to roost as the sun sets. We are lucky to get anywhere from 3 – 6 eggs per day from our hens. It is really quite amazing that they can produce such a healthy nutritious food. 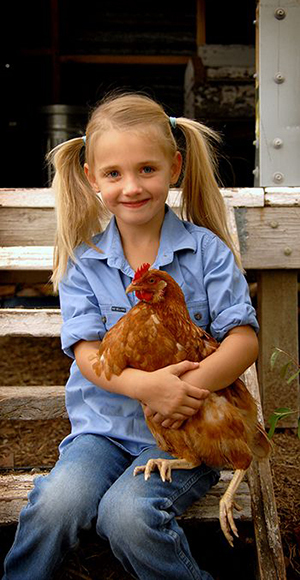 We hope you enjoy Midgee’s Mudgee Farm Fresh Eggs!